I help businesses and business owners and leaders, make their life easier, business life easier. Now one of the best ways to do that is to get rid of the stress of where’s that next customer and that next sale and the next order coming from? So if we could get rid of that, if customers knocked at our door so often that the only way to get rid of them or to quell the queues, would be to put the prices up, would that be a bad thing? Think about it. Well if you need a hint, no it would be a good thing. And that’s what this is about. I also give you little tips on how to make other things easier. And why on earth would you want to listen to me, this funny looking English guy with the grey hair? Well, not only because he is really good looking but also because the guy, that’s me by the way, third has been doing this for thirty odd years and I don’t have to, this is all for free. Why on earth would I be telling you? I can’t extract money or credit cards from you just by playing this; this is to help you have a better life, take it for what it is, please. It is currently at the time of recording a very ultra low priced monthly membership group that costs twenty nine pounds per month, twenty nine fine English pounds, that’s roughly thirty five American dollars I think at the moment and possibly about forty Canadian dollars. But whatever it is it is worth it, you can easy come, easy go, no contracts, if you don’t like it I will give you all of your money back, just ask. 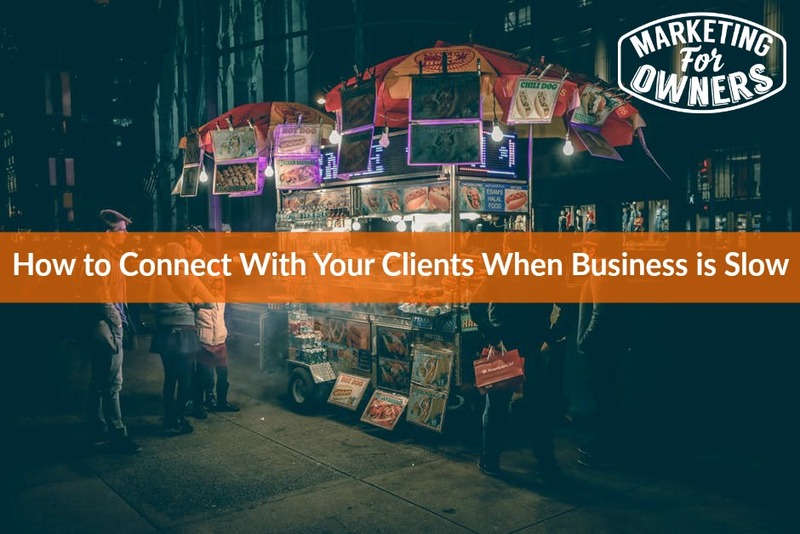 So off we go, this is ten quick fire tips, how to connect with your clients when business is slow. Yes, are you thinking that because somebody is no longer a client of yours that they don’t like you? It was probably because you finished the project, they finished the project, they had other things on their mind, they had different priorities at the time. They may have forgotten about you in all the busyness that they have in their lives the same as you but they have trusted you before, they will trust you again and I include those ones that you think don’t like you. More often than not they do but they are just different. Even the ones that you know don’t like you, I would contact them again. I can promise you I have had in the past people I have thought did not like me, if you ever meet me in the pub or buy me a drink, I’ll explain these couple of stories. I have tried to get rid of them on the phone and told them in extremely clear language and have not been able to get rid of them when I thought they didn’t like me. There you go. Facebook live, Periscope, etc. I mean Facebook live is the big one at the moment and probably for the future, but live stream, do something different. If you think, what can I live stream about? Because I have a boring business like I sell fire extinguishers or something. Oh, that’s me, how about Q & A? Have you got an FAQ’s page on your website? Has anyone ever, ever in all your experience asked you a question? Well, answer it online, it doesn’t have to be long, it doesn’t have to be posh or flash or scripted, just answer it, be honest and then it’s there. It also fills up your Facebook page with content. If you are not sure what these may be, give out a prize. For example, you could say we have got ten free fire safety audits, the contest will run over this month or over these two weeks and we will give ten free fire safety audits. Of course, you are trying to aim at people within your target market but you’re also trying to find new people, you might think, I am saying “Fire safety audit” because I sell fire safety stuff. So you are thinking, well who on earth would want that? It doesn’t matter, I would think same, but if they are targets for my products they might want it and it’s easy. Go to separate companies called Gleam, Woobox, Giveaway Tools or Raffle Copter, to name but four top ones. I would check out Gleam if I were you. What you can do is make people just enter, it’s like a sweepstake; and these things, go and look at them, they will explain it all, it’s dead easy. But anyway, you can give them a free entry if they re-tweet this, two extra free entries if they share it on their Facebook, five other entries if they join your newsletter list, twenty if they buy a product from you etcetera, etcetera. It encourages people to take action, you will build massive social media followings of raving fans, trust me, go look, it is dirt cheap, most of them have a free version. Take photos on your phone and have them ready for a no news day then put them out on social media or on your blog when you have got nothing else to write about. Create a report or a download or a video or something, something of value and tell people that you have it. Update your business cards, change them, get a new design. Again go to fiverr.com, stuff generally costs five dollars, three pounds fifty, sometimes they cost ten dollars, seven pounds; you can get new business cards designed in twenty four hours. If you don’t like it, ask them to do another and if you don’t like that, go and to try someone else. It was five dollars, that’s where I get all mine done. In actual fact, I have designed a lot of our ads on Canva.com myself. Anyway, don’t tell anyone. Create a testimonials page on your website if you haven’t got one, or update it if you have got one. And contact everyone and say, “Have you ever had a good experience? Could you write in and we would like to feature you and we will give you a link to your website.” That is the bonus for them. Go and visit people, go and visit clients, talk to them, ask for their opinion, ask what other services they would like you to provide, ask where else they buy stuff that is related, where they used to buy, who else have they bought from, who else do they buy from now and then provide those services so they don’t have to go elsewhere. Comment on their social media pages, say “Hi! Great to have you as a client, we love you, love what you do, appreciate you and what a wonderful website you have got! What a lovely nice new puppy you have got!” (Or a nice new kitten, or a nice bit of bacon or whatever they are posting about.) Do you understand? Stop coming up with excuses, I have just come up with ten ways to connect with clients when business is slow. Current or previous or past clients are easier to sell to than finding new people; that’s what it’s all about. Anyway today is a Thursday, I am sure ten points is enough, it is a drive time podcast recommendation and if you haven’t heard this one before, it is great. 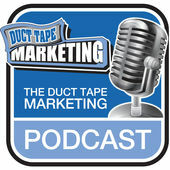 It is my good friend John Jantsch and he has Duct Tape Marketing, the Podcast. Duct Tape Marketing, Google it, buy his books, read his books, follow his podcast, all round great bloke. We will have a Ones to Follow tomorrow; I think it might be Melanie, I can’t remember, but you have to pop back and find out. Speak to you soon.